Why using source control plugins in IDE instead of stand alone client application? Usually source version control systems are offering plugins for different integrated development environment (IDE). Using these plugins will save time and will make developers more effective. They have not to leave the IDE for different version control operations like commit, checkout, update, revert and more. 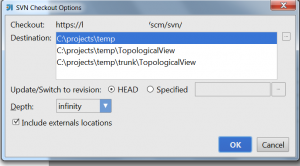 They can get revision history and compare different revisions or get some specific changes in one file inside the IDE. Another benefit of using these plugins are ability to integrate them with issue tracking systems. It will be possible to create change lists based on a some specific issue and connect source control and issue tracking to each other. The SVN plugin installed in Intellij is not working with the new version of SVN (while writing this post TortoiseSVN 1.8.5 and Intellij IDEA 13.5). So it is not possible to use stand alone application and the SVN plugin in Intellij on the same folder. With other words you should either use stand alone application or Intellij plugin. To solve this you should download and install SVN command line client. In this page you can find some implementation of command line client. I chose VisualSVN and downloaded its command line client. After downloading zip file and unzipping it copy the content of ”bin” directory to your TortoiseSVN bin directory (probably this path: C:\Program Files\TortoiseSVN\bin). The next step will be to checkout files from your repository inside Intellij. 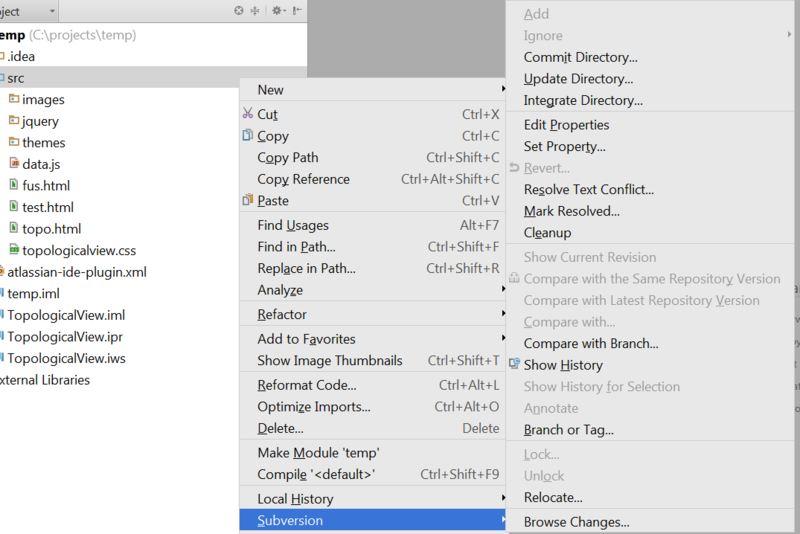 In the Intellij menu choose VCS->Checkout from version control->subversion. In the new window add your repository and click on checkout. In next window select the checkout destination directory. In next one you can choose some checkout options like folder and the revision. See figure below. The next window is asking about the working copy format. You should choose the same format as your ToroiseSVN version number in this case 1.8. Answer to the warning about creating project no and then you are finished. You can see the files in Intellij. 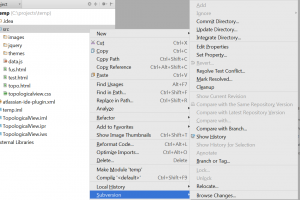 After this it is possible to see the Subversion on the context menu while right clicking on a file or folder and do usual version control operations. See the figure below. The ”changes” view in Intellij will help you to see the last changes and manage your change list. If it is not activated you can activate it by pressing Alt+9 short commando or by choosing the menu option View->Tool Windows->Changes. With right clicking on your version controlled folder and choosing ”show in explorer” option you can open the folder in the windows explorer. You can see that the folder even is version controlled by the ToroiseSVN stand alone application and you can use it for version control your files while having the ability to do that inside Intellij.